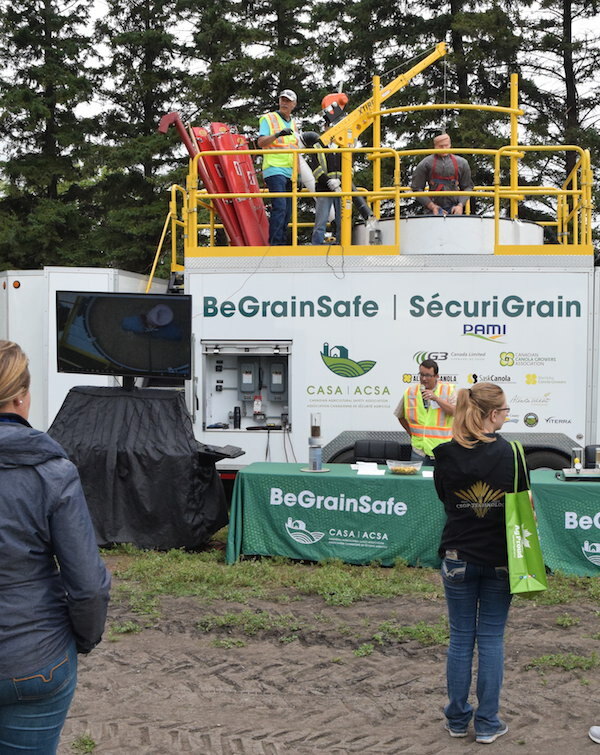 The Canadian Agricultural Safety Association (CASA) BeGrainSafe exhibit describes the risk scenarios for entrapment in grain, and the cumbersome removal steps required to get out someone who is trapped. 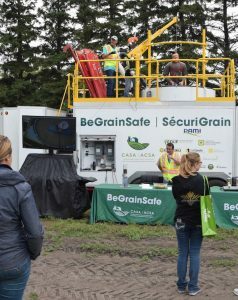 CASA had its BeGrainSafe demo at various farm events over the summer. Grain entrapment is a bigger risk now with larger storage facilities and faster augers. It can take seconds to be buried. The best move is to stay out of bins while they’re being filled or emptied. Usually the only time a person feels the need to enter a bin is if grain is bridged or crusted. This can be a very dangerous situation, especially if a wall of grain is released and buries a person. –Don’t enter a grain bin unless you have a plan. Make sure children know the grain bin is off limits. –If you must enter a grain bin, have at least two people nearby prepared and capable of helping in an emergency. –Use extreme caution if entering a bin with wet, mouldy or spoiled grain in it. Air hazards may include toxic gases, dusts and reduced oxygen content. Turn on the blower and use respiratory protective equipment in such situations. –Lock-out the power source to the auger, ensuring no one can start filling or emptying the bin while you are inside.